Our Green Valley Home Sales October 2015 Update provides a quick overview of the Green Valley Home Market for Single Family Residence (SFR). Just click the link below to view the latest Single Family Residences month activity. To see this months home sales report for all of Tucson – GO HERE! Our Green Valley Home Sales Video Update summarizes the recent real estate activity in Green Valley AZ. The Green Valley home sales October 2015 report includes Quail Creek. This growing Robson Resort Community of Quail Creek is located in Green Valley AZ. This 55+ community has resale and new homes available. The community is opening additional lots regularly, so there is likely to be a perfect home site and floor plan to meet your needs. An amenity of Green Valley Arizona Real Estate is the Green Valley Recreation, Inc. As a non-profit organization it serves the leisure and social needs of the community. GVR operations include a Member Service Center and 13 recreation centers. GVR has a private membership of over 13,000 households and an estimated 27,000 individuals. It is worth noting that membership is a deed restriction in perpetuity on the property. Cancellation of membership is not an options. GVR Membership passes from owner to owner when a property sells. For the art lovers, residents and visitors frequently take a short drive to Tubac and visit its many artisan shops and dining. Community’s fire protection is provided by The Green Valley Fire District and Rural Metro. There are three fire stations providing fire and emergency medical services. In mid 2015, the Green Valley Hospital opened to serve the medical needs of Green Valley and Sahuarita residents. The hospital will have 50 acute care beds, 4 operating room, emergency room and full ancillary services. Green Valley is still unincorporated. A “Coordinating Council” has been created to address community issues, growth and development. The “Coordinating Council” services as the local volunteer government in place of a local legal jurisdiction. Green Valley Arizona Real Estate provides affordable retirement living in a smaller community with easy access to the City of Tucson, Vail and Mexico. 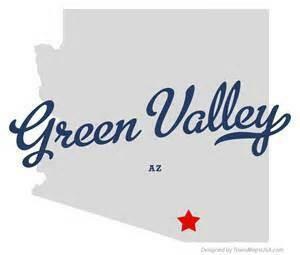 For more information on Green Valley Arizona visit the Green Valley Chamber of Commerce Website. Looking for Rancho Sahuarita homes near Green Valley AZ OR other Tucson Retirement Communities? We can help. Questions about the Green Valley home sales report or Green Valley Homes for Sale? Call Us 866 316 5575 OR complete the CONTACT FORM and we will get right back to you!